There is a bizarre drama in the presence of the two brewers in overalls in this picture of the Truman Brewery in Brick Lane, looking like ants by comparison with the tall Coppers towering above, each with the capacity for boiling four hundred barrels of liquid. Can you even find the second brewer, high on a gantry up above his colleague busy stirring with a long pole? 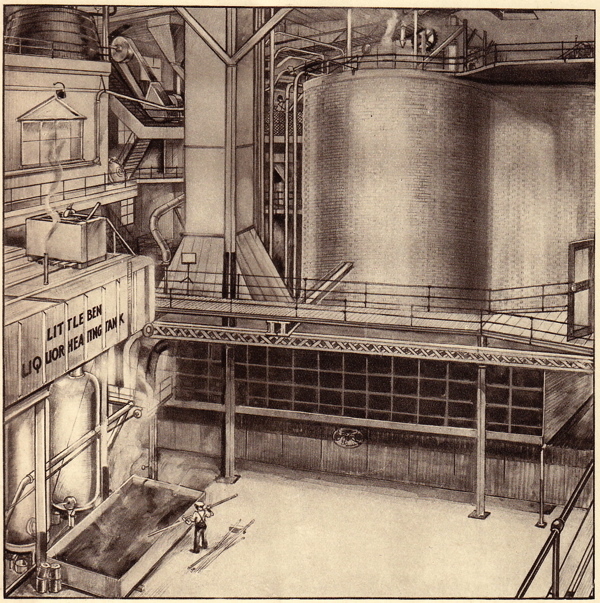 This is an illustration of the crucial stage in the brewing process when the hops are added to the boiling “wort,” as the malt infused liquor is called before it becomes beer. Yet in spite of the awe-inspiring modernity of this vision, you can still see the smallest of the Coppers in the top left corner within the shell of the seventeenth century brewhouse, itself enclosed by the vast brewery that grew up around it. The tension between the heroic scale of the brewing operation and the modest figures of cloth-capped workmen scurrying around appears comically absurd today. The industrialisation of the process which this sequence of pictures celebrate is unremarkable to us, it is the presence of the wooden barrels and use of horsepower that we find exotic. This is a quaint English modernity which has more in common with W. Heath Robinson than Fritz Lang, while the agricultural illustrations of the cultivation of barley show a haywain reminiscent of the work of John Constable and stooks of corn upon the hillside just as you would see in a landscape by Samuel Palmer. 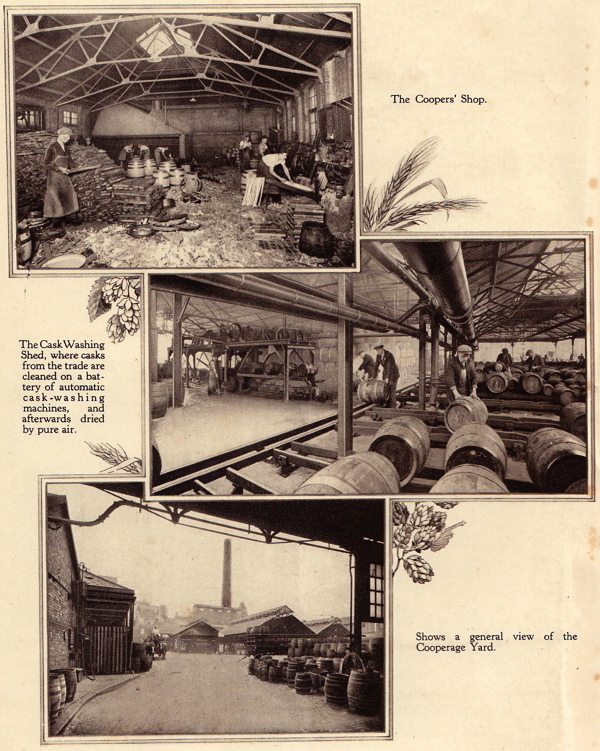 These intriguing pictures were created as a supplement to The Black Eagle Magazine, published by Truman Hanbury & Buxton in 1931, and I am grateful to Tony Jack, ex-chauffeur at the Truman Brewery for bringing them to my attention, because they grant a rare glimpse into the working life of the brewery that flourished here for over three hundred years. Like many in Spitalfields, I have long been fascinated to understand the precise activities which once occupied all the spaces that today are filled with new media companies, shops, markets, clubs and bars. Twenty years after brewing ceased in Brick Lane, the presence of that earlier world still lingers in these enigmatic utilitarian structures, even if their original usage is already obscure. Compounding the surrealism, when you examine the sequence below, you will discover that the images at the beginning and the end are photographs while those within the brewery are mostly artist’s impressions. This may be simply because good photographs were not possible within the brewery, but it does give the impression that the brewery contained another reality, stranger the outer world and containing magical possibilities. A notion enforced by references to the use of the Jacob’s Ladder, the Archimidean Screw and the Dust Destroying Plant, while the language of “sparging” the “wort” evokes a universe as strange as anything Tolkien imagined. Yet it was all real, a discrete society with its own arcane language and culture that evolved during three centuries in Brick Lane until it modernised itself out of existence as master brewer Derek Prentice explained to me. 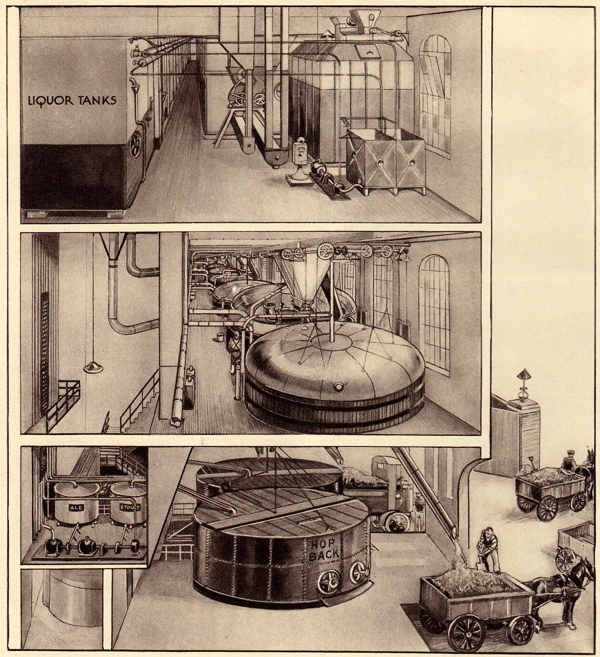 What touches me in these curious pictures are the small human figures – often hidden or partially concealed in the background – and the few artifacts on their scale, the sinks, buckets, barrels and jugs, which appear miniature beside the industrial scale brewing equipment. As mysterious today as a lost tribe, now fled from Spitalfields, it is my project this Winter to interview as many as I can of these fleeting characters and recreate this vibrant world for you from their testimonies. Watch this film of Trussing the Cooper, an initiation ritual for cooperage apprentices. 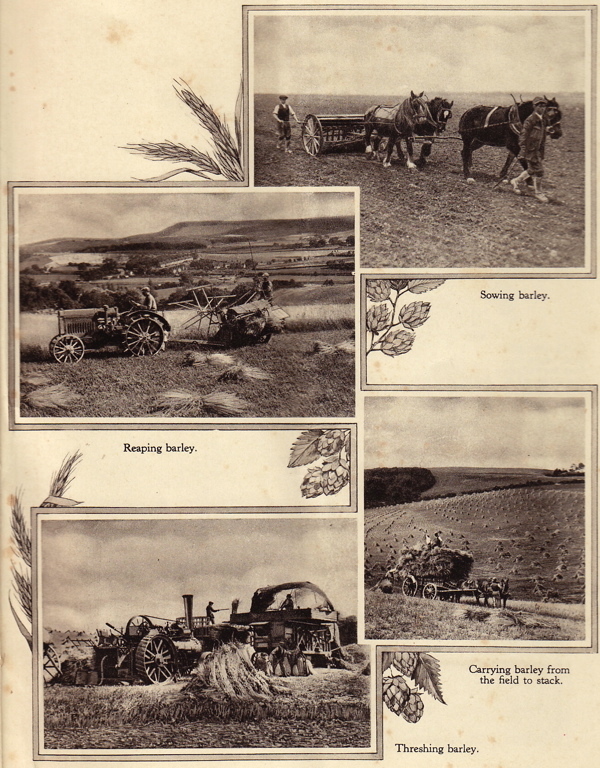 A mixture of machinery and horsepower was used in the production of Barley in 1931. 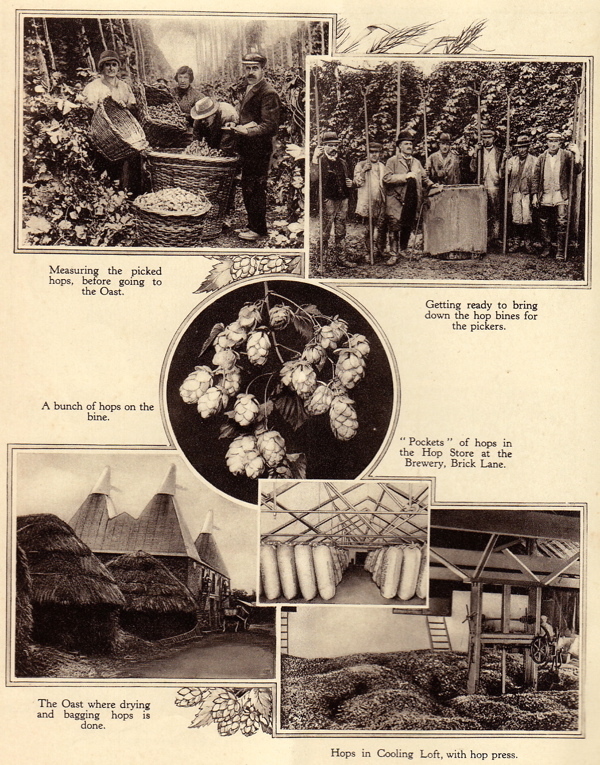 Many East Enders travelled down to Kent each year to work as hop pickers. Barley arrived at the Maltings, where it was hauled up to the top storey, spread out onto the floor and covered with water, turned daily for ten to twelve days, and thinned out when it began to germinate. Then the Barley was transfered to the Malt Kiln and heated until it reached two hundred degrees farenheit. The Malt, as it now was, came from the Kiln and was cooled before being stored. 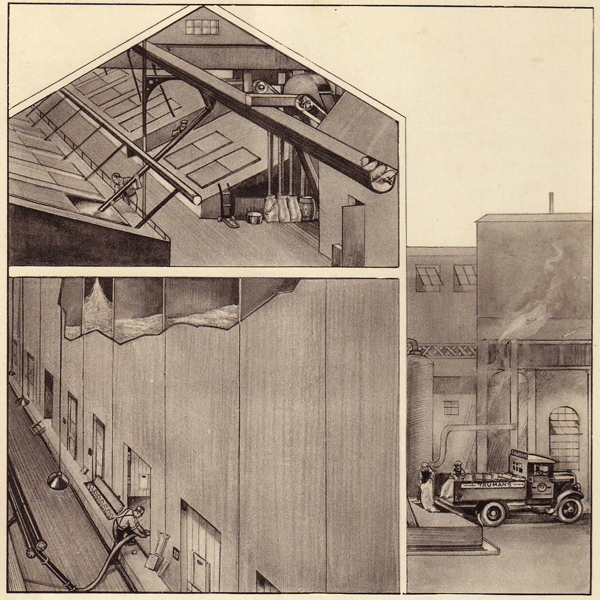 On the right you can see the Malt is being delivered at the Brewery in Brick Lane, then elevated to the Malt Loft by means of a Jacob’s Ladder, which you can see top left, and distributed by means of a Screw to Malt Bins with a capacity of 12,000 quarters. At the bottom, you can see the Malt being transferred from the bins for the day’s brewing by means of an Archimedean Screw. 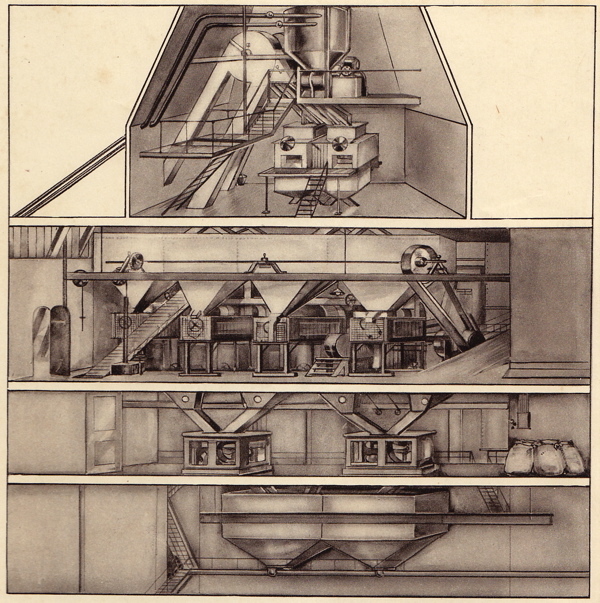 The movement of the Malt caused dust to rise and thus a connection with a large Dust Destroying Plant was required. The Malt was received from the Malt Bins in the Malt Tower and Weighing Room at the top of this picture, before being passed through the Malt Screens on the floor below to remove any foreign matter. Then the Malt was weighed again before going into the Hoppers beneath, from whence it was again lifted by suction to the Tower in the New Brewery. This is the Malt Tower, from where the malt was distributed down through various Blending Hoppers and then ground in the Malt Mills below. In the top picture, the Malt passes to the Grist cases ready for the Mash Tun. In the next picture you see the Mash Tun Stage. 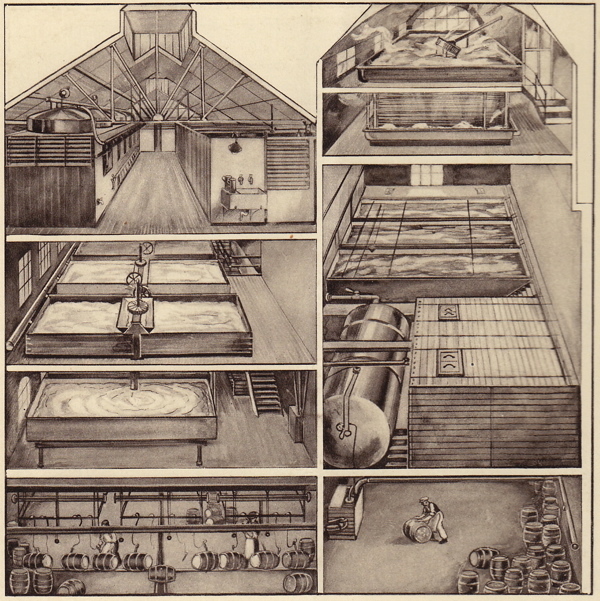 On entering the Mash Tun, the Malt was mixed with Liquor, allowed to stand and then “Sparged” at a rate of one hundred and twenty barrels per hour to create a substance resembling porridge. 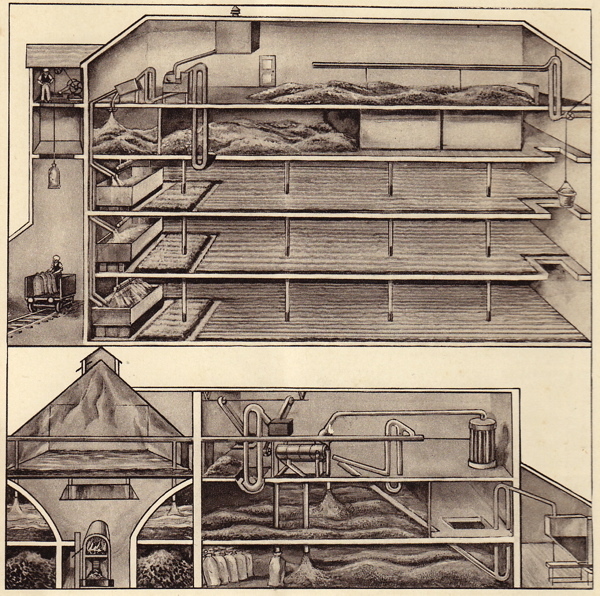 The resulting liquid, referred to as “Wort” was run off into the receivers you can see bottom left, labelled Ale and Stout, while on the right you can see the used Malt being removed by farmers. The Wort was then boiled in the Coppers, that you see in the picture at the very top, where the Hops was added. In these pictures you see how the Wort was pumped from the Coppers through the Refrigerator Room at the top and then into the Fermenting Squares on the floors below where the Yeast was added and fermentation took place. Finally, the Yeast was collected in the vessel in the top right and the Beer was run to the Racking Square and put into casks. 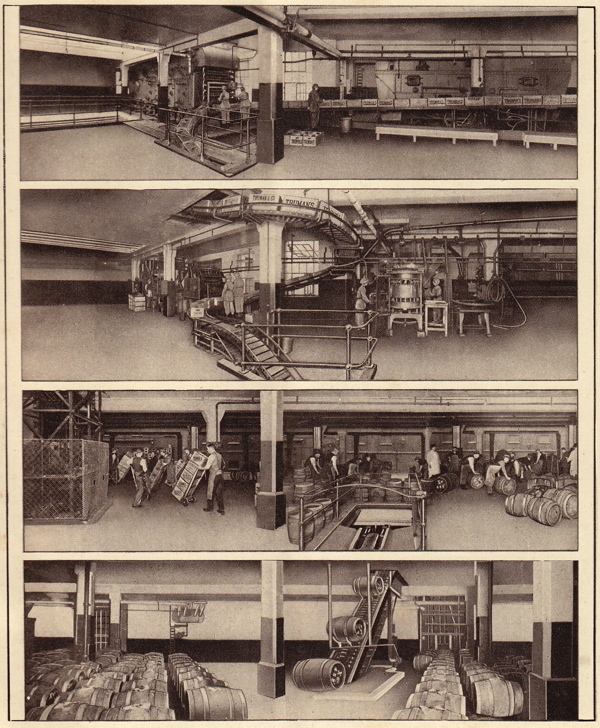 Above, in descending order, you see the Bottle Washing Floor, the Bottle Filling Floor, the Loading-out Stage and then the barrels in the cellars ready for loading. Read the story of how Michael-George Hemus & James Morgan are bringing back Truman’s Beer. This is an image from my own home town of Thornton Heath clearly showing the brewery name at the top of the pub. 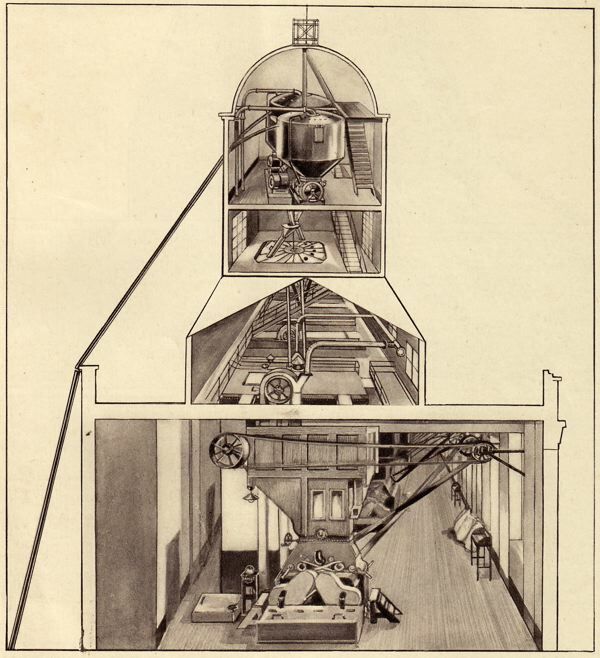 To correct a slight inaccuracy: Wort was initially run off from the mash tuns into the receivers marked Ale and Porter which held this for addition to a later copper (normally the same copper was used twice..for example three mash tuns would feed to copper 1, then copper 3, then copper 1 again and finally copper 3. The contents of the receiver (underback) were added to the second use of each copper. After boiling with hops the wort passed through the hop back (where the hops were strained out) and was then pumped up to the cooler and distributed to the fermenting vessels.